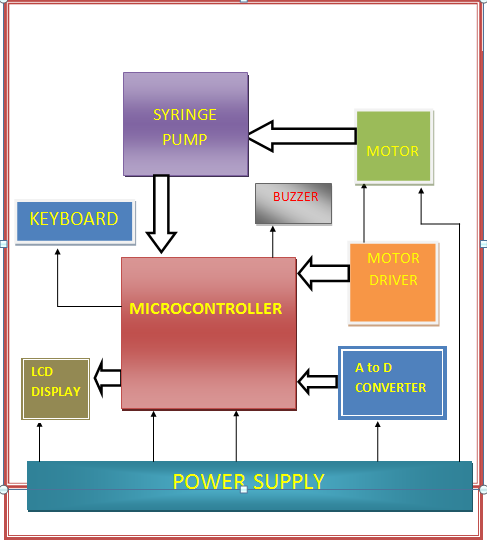 The project aims at designing a microcontroller based infusion device which will control the motor and thereby monitor the delivery of fluid to the patient via the syringe pump and generate alarm in case of any erratic operations. While infusing the fluid in the patient’s body the motor will produce the force or torque required to push the syringe plunger inwards due to which the fluid will be injected in the body. The microcontroller will drive the motor driver and hence the displacement obtained by pot is directed to the ADC.The ADC converts this into a digital value and the thereby the values can be obtained at the display. The speed of the fluid is controlled by the motor torque and hence can be adjusted by increasing or decreasing the motor torque. The basic principle of the automated drip rate controller is that when the motor operates the piston moves which is controlled by the microcontroller and the driver circuit and then passed on to display for showing the drip rate. The alarm in case of any abnormalities gives us the signal that the syringe is empty or the intervals of fluid infusion are extended. The power supply circuit is used to convert 230V AC input supply in to 12V DC & 5V DC output supply to energies the main circuit. It contains a 12V step down transformer followed by full wave rectifier circuit to convert AC to pulsating DC.A capacitor is used to convert this pulsating voltage to pure DC voltage. Voltage regulator IC LM7805 is use to get 5V DC supply as output for the circuit. The power supply requirement for this circuit is +12V & +5V regulated DC. This P.S. circuit uses two centre-tapped FWR for rectification. The circuit comprises of voltage regulator, IC 7805, IC 7812, diodes, capacitors. The capacitors are used as filter to eliminate ripple in output. The 5V is needed for biasing the microcontroller and other components. The microcontroller used is AT89S52. The AT89s52 is a low-power, high-performance CMOS 8-bit microcomputer with 8Kbytes of Flash programmable and erasable read only memory (PEROM). The device is manufactured using Phillips’s high-density nonvolatile memory technology and is compatible with the industry-standard MCS-51 instruction set and pin out. The on-chip Flash allows the program memory to be reprogrammed in-system or by a conventional nonvolatile memory programmer. The Microcontroller receives the input value from the ADC and according to those values directs the output device like LCD and relay driver circuit. The main function of the Microcontroller is to compare the Set Point values with the detected values and send signals to the respective devices if the value exceeds the Set Point values. The Microcontroller is programmed in such a way that it will vary the output of the system if there is any change in the input quantity. The microcontroller circuit uses IC AT89S52, 12MHz crystal oscillator, diode (IN 4148), resistor, capacitor, 1K SIP resistor. The display section includes 16 pin relimate connectors and 16-character dual line display. The AT89S52 is a low-power, high-performance CMOS 8-bit microcontroller with 8K bytes of in-system programmable Flash memory. The ADC is used to convert analog quantity into digital equivalent value so that the Microcontroller can read the values of the input quantity. The design of the ADC 0808 has been optimized by incorporating the most desirable aspects of several A/D conversion techniques. The ADC 0808 offers high speed, high accuracy, minimal temperature dependence, excellent long-term accuracy and repeatability and consume minimal power. These features make this device ideally suitable to applications from process and machine control to consumer and automotive applications. In this we are going to use L293D to drive our dc stepper motor. The L293D is designed to provide bidirectional drive currents of up to 1 A at voltages from 4.5 V to 36 V. The L293D is designed to provide bidirectional drive currents of up to 600-mA at voltages from 4.5 V to 36 V. It is a high voltage, high current dual full-bridge driver designed to accept standard TTL logic levels and drive inductive loads such as relays, solenoids, DC and stepping motors. Two enable inputs are provided to enable or disable the device independently of the input signals. Here we have used geared dc motor of 12V and 1A.The geared DC motor is ideally suited to a wide range of applications requiring a combination of low speed operation and compact unit size. The integral iron core dc motor provides smooth operation and a bi-directional variable speed capability while the gearhead utilises a multi-stage metal spur gear train and a diecast metal housing rated for a working torque up to 1.0Nm. The unit is suitable for mounting in any attitude, provides reliable operation over a wide ambient temperature range and is equipped with a rear shaft extension to which a speed or position sensor may be attached. The geared DC motor unit offers a range of gear ratio options for operating speeds from 5-500 rpm and is ideally suited to applications where a combination of high torque, compact size and economic unit price are important design criteria. A liquid crystal display (LCD) is a thin, flat electronic visual display that uses the light modulating properties of liquid crystals (LCs). LCs do not emit light directly. Its low electrical power consumption enables it to be used in battery-powered electronic equipment. It is an electronically-modulated optical device made up of any number of pixels filled with liquid crystals and arrayed in front of a light source (backlight) or reflector to produce images in colour or monochrome They are usually more compact, lightweight, portable, less expensive, more reliable, and easier on the eyes.The parameters which we are using in our display is the Drip rate and the quantity of fluid that is injected. · It has Min and Max buttons for the scrolling purpose. · ▲▼ – The ascending and descending keys are used to change the numbers on the display. · ▼ Down Key makes numbers decrease. · When the underline cursor is placed below the decimal point, the ▲▼ keys shift the decimal one place up or down. · It has MODE to select the parameters i.e. drip rate, quantity, etc. · START key starts the Pump’s operation. · STOP key stops the Pump’s operation. Buzzer is used to denote a problematic or an unwanted output of the system which can be properly taken care of. We are using buzzer in the circuit to give an alarm if the plunger flange exceeds the quantity of fluid that is injected. 1. We are using power supply circuit to convert 230V AC supply in to 12V & 5V DC supply to energies the main circuit. 2. Transformer T1 is a 12V step down transformer used to convert 230V AC in to 12V AC. 3. This 12V AC is then passed through a Full Wave Bridge Rectifier (BR1 and BR2) which converts it in to pulsating DC. 4. To convert this pulsating DC in to pure DC, we are using 1000µf electrolytic capacitors C1, C2, C3, C4 which works as a filter. 5. This 12V DC signal is fed to LM 7805 (3-Terminal 1A Positive Voltage Regulator) and LM 7812 as input signal to get 5V DC and 12V DC output respectively. 6. To remove any high frequency noise we are using capacitors at the output of 5V and 12V DC. 7. A LED is connected at output to indicate status of power supply. 1. Main circuit consists of microcontroller AT 89S52 along with this, it comprises of ADC 0808,motor ,motor controller IC L293D,keyboard circuit LCD and pot of 10K . 2. Port 0 pins of microcontroller are connected to the ADC 0808.when the motor is on there is a change in the potentiometer which is directly connected to the ADC 0808. 3. This change in the voltage is given to the ADC 0808 which converts the given analog voltage to a digital value. 4. This obtained digital value is given to Microcontroller 89S52 and then to display. 5. Port 2 pins of microcontroller are connected to the LCD to display the observed value. 6. There is a keyboard designed which uses four switches connected in parallel in order to start ,stop, reverse direction of the motor. 7. The motor controller IC L293D is connected to the port 1 of the microcontroller 89S52.there is a interval set on the syringe in which the infusion has to take place. 8. When the motor is started through the START switch on keyboard, the diodes D3 and D4 start conducting and the motor starts working. 9. When the stop key is pressed the diode D1 and D2 are connected which is directly connected to the ground and the motor stops working. 10. The green and red LED’s are used to indicate the motor direction i.e. clockwise and anticlockwise. 11. When the motor is switched on, the syringe plunger is moved in and out and if the syringe plunger is pulled out more than 50 ml (maximum position) than the buzzer rings on. 12. Similarly when it exceeds the minimum position it again gives a buzzer .thus the infusion is controlled in a set interval. 13. The quantity of fluid that is injected in and out is displayed onto the LCD and the time that it takes to inject is also displayed. The Buzzer circuit has a transistor whose base is connected to the P1.4 pin of microcontroller. The transistor is used to drive the buzzer. The resistor is used over there for biasing the transistor. The transistor gets short-circuited and the buzzer rings giving an alarm of the end point of infusion. The mechanical unit consists of the base plywood, motor, three gears, main rod, support block, two C-shaped clamp, plunger rod, and syringe and potentiometer. Dimensions of the ply base are 1.5 X 1.feet on this baseply syringe is placed at a height of 1cm.the syringe plunger is connected to the main rod with the help of a guide rod and a support block. The main rod is 31 cms long threaded rod. The guide rod and the main rod are supported by a C shaped clamp which is 20 cms in length and guide screws of 5cm outer diameter. The gears used are for motor and pot control. A gear is a simple device that can change the speed, direction or torque of a motor. · In a country like India where there are several deaths due to under or high infusion rates we need a device that monitors the rate of infusion accurately as and when needed by the patient. · NTG (Nitroglycerine) is used to reduce blood pressure. By regular flow of this drug through the drip rate controller, the blood pressure can be effectively maintained. · Dopamine is used to increase the blood pressure of the human body. By infusing this drug in the veins with the help of a drip rate controller blood pressure can be controlled. · Tirofiban is initially given as rapid intravenous infusion at a rate of 0.4 µg/kg and minute for 30 minutes. Upon completion of the initial infusion, the rate is decreased to 0.1 µg/kg and minute delivered as continuous infusion. · Drugs such as azathioprine and mercaptopurine which modify the actions of the immune system, are effective for people with Crohn's disease who do not respond to other drugs and are especially effective for maintaining long periods of remission. They significantly improve the person's overall condition. · The human errors occurred by the nurses while monitoring the rate manually can be reduced by the automated drip rate controller. · The drip rate controller also avoids the leakage of fluid during infusion as compared to the basic infusion system. · Suited for all volumes of liquid. · Low cost of disposables. · Pressure maintains rate inspite of resistance. · Delivery of air impossible. · It is not self adjustable by the patient. A skilled operator is necessary for the operation. This project can be further extended into a complex and more sophisticated system. · We can also measure the pressure and temperature of fluid to be infused. · We can also make it patient wearable and portable pump. · Co-processors can be introduced to make the microcontroller speedy. · We can also enhance the device by detecting the occlusions in the fluid path. · We can also include Wireless connectivity for reporting alarms in central nursing station in ICCU.